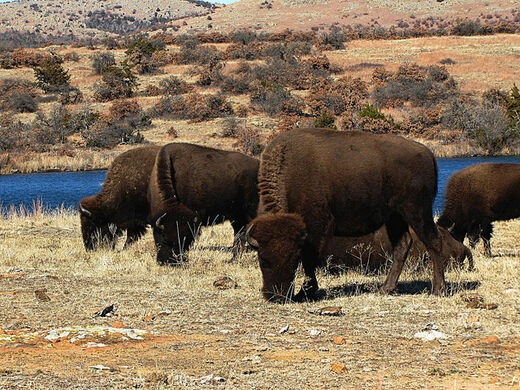 The buffalo that roam over the Wichita Mountains National Wildlife Refuge in southwestern Oklahoma are direct descendants of 15 American bison who traveled by train from the Bronx Zoo over 100 years ago. It’s estimated between 30 and 60 million American bison roamed North America from central Canada down to Mexico two centuries earlier. After mass slaughter, sport-hunting, and encroaching settlement, that number was brutally brought down to just over 1,000, both in the wild and in captivity, by the beginning of the 20th century. 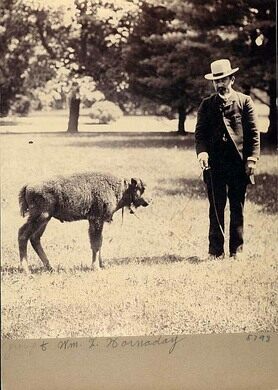 Aiming to save the bison from disappearing completely, William T. Hornaday, the first director of the Wildlife Conservation Society, and Theodore Roosevelt formed the American Bison Society at the Bronx Zoo, then called the New York Zoological Park. On October 11, 1907, the first 15 bison to leave that breeding program boarded a train to cross the country to Oklahoma. When the train pulled into Cache, Oklahoma, seven days later, the bison were greeted with much fanfare by a party including Comanche Chief Quanah Parker. The huge crates were loaded onto wagons and the bison then traveled 13 miles to the Wichita Mountains where they went went on to flourish, so much so that there were even annual auctions to keep the herd’s number in check. By the 1930s, the American bison count was up to 20,000. Thanks in no small part to the American Bison Society, there are now around half a million bison in North America. 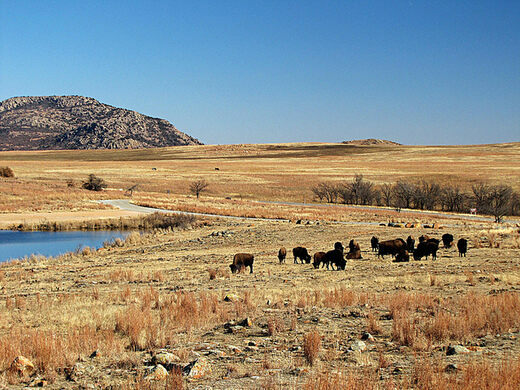 Located in Comanche County, the Wichita Mountains National Wildlife Refuge is Oklahoma’s largest wildlife refuge at 59,000 acres. Unlike the majority of the buffalo left living in North America, they are able to roam free. In 2005, the Wildlife Conservation Society relaunched the American Bison Society to continue to preserve the American bison and their ecological future. This highway overpass was named after the tragic disappearance of a young mother who got mixed up with the wrong people. Wander among free-roaming storks at the sanctuary that helped save them from local extinction.